Yao Defen, the world's tallest woman, has died in China at age 39. Yao, whose height of 7 feet 7 inches was certified by Guinness World Records in 2010 as that of the tallest living woman, passed away in Anhui province on Nov. 13. No cause of death was released, but Yao's condition was caused by a tumor on her pituitary gland, which interfered with the natural release of growth hormones. By the age of 15, she was already 6 feet 7 inches, and her height made life difficult. In a video from three years ago, she lamented that she was "very unhappy" with her size and asked, "Why am I this tall?" The tallest woman in the world, according to the Guinness World Record book, died recently in China. She was 40. 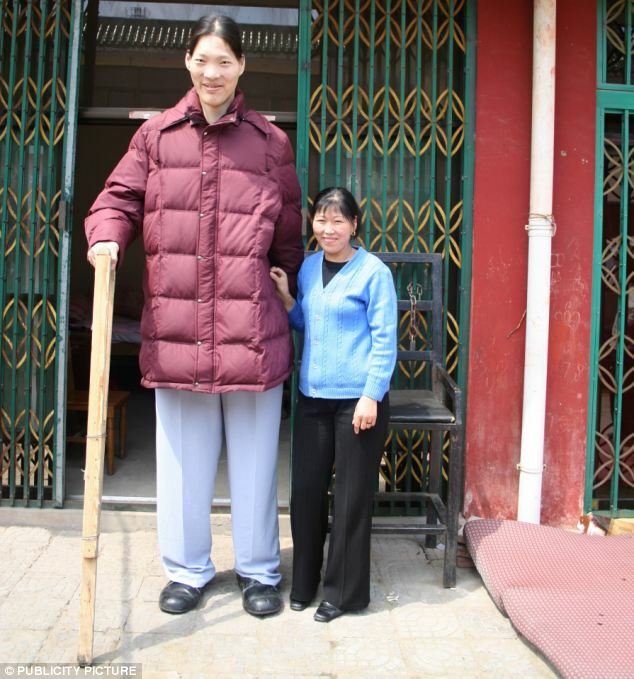 The Chinese woman, Yao Defen, recorded an average height of 7 ft 7 in (2.33 meters) when last documented in 2010. She was from eastern China's Anhui province. "Yao Defen died in the middle of last month," a spokesman for the government of Shucha township, where Yao lived, told AFP. According to a local newspaper, she died on Nov. 13. U.K's The Mirror reports that she died at her home in the province of Anhui on November 11, citing official state media. When she was recorded as the Tallest Living Woman in 2010 by the Guinness World Records, there was evidence that Defen was still growing. Her height was a result of gigantism caused by a tumor on her pituitary gland, the organ that regulates the production of growth hormone. According to the Guinness World Record, she was already seriously ill in 2010 and she couldn't be re-measured. Yao was a basketball player when she was 15-years-old and she reportedly measured 6 ft 7 in tall (2m). Defen also was the third tallest woman who ever lived. The tallest woman ever was Zeng Jinlian also from China who measured 8 ft 1.75 in (2.48m) when she died on February 1982 at age 17. Jinlian reportedly suffered from severe scoliosis (curvature of the spine) and could not stand up straight. She began to grow abnormally from the age of four months and stood 5 ft 1.5 in ( 1.56 m ) before her fourth birthday and 7 ft 1.5 in (2.17 m) when she was 13, according to Guinness. Jinlian's hands were also of gigantic measures. Her hands were 10 inches long and her feet 14 inches long. Inasikitisha. Ila kwa ugonjwa alionao wa mifupa ambao hawa watu warefu sana au wafupi sana wanaumwa, inabidi niseme "Heri apumzike." Wanaishi kwa shida sana hawa watu warefu ila wana mifupa dhaifu. Udhaifu ni kitu kibaya sana na zaidi ukiwa RAIS maana unaleta mateso kwa watu wengine ila siyo wewe. Its amazing how God created a balance in the body huh? I bet it wasnt easy to lead a normal life with that height. Rip dada. Ndio yale yale aliyolalamika Remmy Ongala (RIP) alipoonekana mrembo mbele ya Masoud sura mbaya...ooh sijui ana Ukoma! "Her height was a result of gigantism caused by a tumor on her pituitary gland, the organ that regulates the production of growth hormone."